What are the Different Types of HVAC Units? Greenville, SC – You may not have given the types of HVAC units available much thought when installing it in your home or office, but there are actually different types of HVAC units, each with their own benefits and drawbacks. 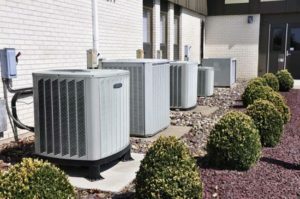 If you or your business is considering installing an HVAC unit in your building, it is worth taking a second look at they types of HVAC units available. There are four main types of HVAC systems. There are split systems, hybrid systems, duct-free systems, and packaged heating and air systems. Each of these types of HVAC units have pro’s and con’s, and knowing these factors can help you decide which is best for you. The most common types of HVAC systems are the heating and cooling split systems. As the name would imply, the system is split between two main units, one for heating and one for cooling. These systems are notable because they contain both indoor and outdoor units, which are easily recognizable. 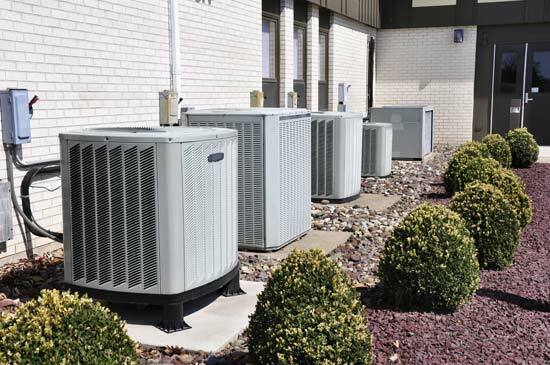 These types of HVAC units have a cooling system outside, which uses refrigerant, compressors and coils to cool air, and a fan to blow out hot air. These are usually the large AC units placed outside the home, which run during the summer. The heating and cooling split systems also has a heater, usually located in a basement or other storage space, which uses gas to heat the house. This is dispersed by either a fan, or evaporator to circulate the air. This system uses a traditional thermostat to manage the temperature, and is able to keep most houses at your desired temperature. Most units are also packaged with purifiers, and humidifiers so no matter the weather your house or workplace is kept comfortable. These systems are most widely used because they are most generally applicable, without specific needs or environmental factors. A hybrid system types of HVACs are similar the split systems, but with some key differences. These systems are on the rise due to their ability to mitigate energy costs through their electric hybrid heating system, which differentiates them from the other types of HVAC systems. This key difference, usually set by the owner, sets these types of HVAC systems apart from the rest of the pack. The ability to switch between gas power, which is quicker and more complete, to electric, which is more efficient and quieter, allows homeowners to decide how they want to heat their home. Useful in more mild climates that are capable of taking advantage of this during months where it isn’t too cold, and electric heat will do just fine. This system uses traditional ducts, as well as thermostats, and provides all the benefits of a split system, but with the added option to conserve energy, and lessen utility bills. A duct-free, or mini-split system is a unique system with large upfront costs, but big benefits for certain needs and applications. These types of HVAC units are individual units in each room, providing greater independent control. These units are mounted on walls indoors, and are usually attached to an outdoor compressor. This installation process is expensive, and visually obvious for the owners. These units are perfect for new additions to homes, such a garages, additions, or additional buildings, because it is easier to install, and allows independent control of the unit. These types of HVAC units are also beneficial for service businesses such as hotels or venues, allowing tenants to control individual temperatures and conditions. Another benefit is energy conservation, since individual rooms that are being used are being heated, it keeps exterior or unused rooms from wasting energy. This is why individuals retiring or downsizing could seek to install these systems, keeping the rooms they use warm and the rooms they do not use from sapping energy. These systems to require regular and intensive cleaning and maintenance, which is important to keep up with as the cost of total repairs and replacements are expensive. Out of all the types of HVAC units, packaged Heating and Air is the most niche. The system is a contained heating and air unit, that is stored within the house. It is usually kept in an attic or top floor storage space, and serves to both cool and heat a house. Its compact size makes it useful for smaller spaces or houses, and allows it to be placed within the home if an exterior is not an option. These types of HVAC systems are also able to be very efficient, and easily maintained. They are generally used in warmer climates, since the heating system is not as powerful as other options. The heat is generally electrically generated, but other forms can combine gas and electric abilities. In summary, there are many types of HVAC units, but now you’re a little better prepared to decide which is perfect for you. The Split system is the most generally used, but hybrids are on the rise due to their energy efficiency. Mini split systems are perfect for picky families or service industry, and packaged heating is perfect for small places, or warm climates. Each of the types of HVAC units has pro’s and con’s and to better help navigate them you can consult an HVAC expert at General Air of Greenville South Carolina. To Repair or Replace? That is the Question. What are the Best Thermostat Temperatures for Summer Savings?